PHOTOGRAPH DONATED BY MR. IVOR FOSTER WHO IS STANDING FOURTH FROM THE LEFT, SECOND ROW FROM THE BACK. DO YOU RECOGNISE YOURSELF OR FAMILY OR FRIENDS, IN THIS PHOTO? Second row down from top second from the right is Paul Brennan . That’s a turn up for the books, glad to see you’re still alive and kicking. I’ve seen lots of comment from your brother Rod on this site. 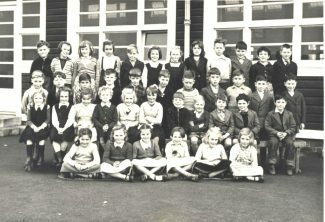 From a cursory glance I recognise a few faces in the photograph David Gilmore on your immediate right, Terry Langham second row from top, second right, Pat Messit directly in front of you, Marion Stowers back row sixth from right and one of the Macartney twins second left front row. I’ll apply my mind and see if I can dredge up any more names. I am in this picture third row with badges on my jacket.